Hi, everyone! Today’s guest teachers are Frisky Sensei and Chuzzle Sensei. They are from Singapore. They will teach you how to use より ( = yori), a comparative form. みなさん、こんにちは！= Minasan, konnichiwa= Hello everyone! = We are Frisky and Chuzzle. = Dochira ga kawaii to omou? = Who do you think is cuter? 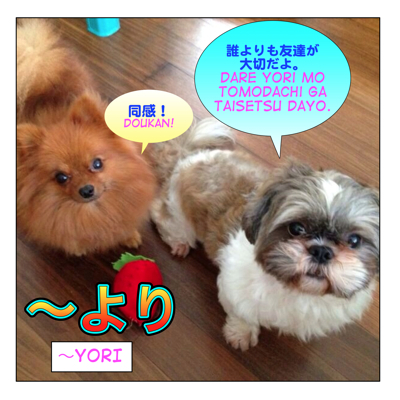 Today we will teach you one of the comparative form with より ( = yori). = A is more + adjective + than B. = Eiga yori (mo) gensaku no hou ga omoshiroi desu. = The original story is more interesting than the movie. = Gensaku no hou ga eiga yori (mo) omoshiroi desu. = Tenpura yori mo osushi no hou ga suki desu. = I prefer sushi to tempura. = Kinou yori kyou no hou ga samui. = It is colder today than yesterday. = Maggie yori neko no hou ga tsuyokatta. = A cat was stronger than Maggie. = Kyouto no hou ga Osaka yori mo Nagoya kara chikai desu. = Kyoto is closer than Osaka from Nagoya. Q: Which is more ~, A or B? / Which do you ~ more, A or B? = A to B dewa dochira ga/dochira no hou ga ~ desu ka? = A to B no dochiraga ~ desu ka? = Raion to tora dewa dochira no hou ga tsuyoi desuka? = Which is stronger, a lion or a tiger? = (Tora yori) raion no hou ga tsuyoi desu. = A lion is stronger (than a tiger). Note: When you answer, you can omit what the subject is being compared with. = Onaji gurai ~ desu. = Dochira mo (onaji gurai) ~ desu. = Both of them are ~. / They are both equally ~. = Dochira mo tsuyoi desu. = They are both strong. = Onaji gurai tsuyoi desu. = They are equally strong. = Niku to sakana dewa dochira ga suki desuka? = Which do you prefer, meat or fish? = Niku yori sakana no hou ga suki desu. = I like fish more than meat. = Dochira mo suki desu. = I love them both. = Dochira mo suki dewa arimasen. = I don’t like either one. = Motokare to imakare to docchi ga yasashii? = Who is sweeter? Your ex-boyfriend or your present boyfriend? = (Motokare yori) Imakare no hou ga zutto yasashii yo. = My present boyfriend is much sweeter (than my ex-boyfriend). = Hitori de tabisuru no to tomodachi to tabi suru no de wa dochira ga ii desuka? = Which do you prefer? Traveling alone or traveling with your friends? = (Tomodachi to ryokou suru yori) Hitori ryokou no hou ga zutto ki ga raku desu. = I feel much more at ease when I travel alone ( than traveling with my friends). = A is more + adjective+ than B. = Maggie wa hana yori utsukushii . = Maggie is more beautiful than flowers. = Tonari no ie wa uchi yori ookii. = The house next door is bigger than our house. = Garakei yori sumaho wa takai. = Smartphones are more expensive than old fashioned cellphones. = Watashi no heya wa ani no heya yori mo semai. = My room is smaller than my brother’s room. = Hokuou wa nihon yori bukka ga takai. = Things are more expensive in Northern Europe than in Japan. = Satou-san wa Tanaka-san yori mo kechi da. = Mr (Ms.) Sato is cheaper than Mr. (Ms.) Tanaka. = Watashi ga sumoutori yori futotteru tte douiu koto? = What do you mean I am fatter than a Sumo wrestler! 1) AはBより ( = A wa B yori). You use B as a basis of comparison in order to talk about A. = Nana wa Misaki yori mo kawaii. = Nana is cuter than Misaki. You are talking about Nana’s cuteness by comparing her with Misaki. =Misaki yori Nana no hou ga kawaii. You are comparing Misaki and Nana. You use 4) Aは、Bほど ( = A wa, B hodo ~ ) in a negative form. = A wa B yori se ga takai. = A is taller than B. = A wa B hodo se ga takai. = B wa A hodo se ga takaku nai. =A wa, B yori uta ga umai. = A sings better than B does. = B wa, A hodo uta ga umaku nai. = B doesn’t sing as well as A does. = A does ~ more ~ than B. = A yori B no hou ga, ~. = Kare wa kimi yori yoku hataraku. = He works more than you. = Kinou wa tsuma yori mo hayaku ie ni kaetta. = I got home earlier than my wife last night. = Shinkansen de iku yori hikouki de itta hou ga hayaku tsuku. = We will get there faster by airplane than shinkansen (bullet train). Now we will see how to use より ( = yori) in more patterns. = Sweet dumplings are better than flowers. = It is more fun to eat and drink than enjoy the flowers. = Ima wa ren’ai yori shigoto da. = I am interested in work more than romantic relationship now. = Kotoshi no fuyu wa Toukyou yori mo Ousaka ni ikitai. = I would like to go to Osaka more than Tokyo this winter. = Furansu ryouri yori mo izakaya de nan (or nani) ka karuku tabenai? = Why don’t we eat something light at an Izakaya (casual Japanese bar) rather than French food? = Wan-Wan hoteru yori Nyan-Nyan hoteru ni tomaritai. = I’d rather stay at the Nyan-Nyan hotel more than the Wan-Wan hotel. = Otouto wa watashi yori mo motto okane wo motte iru. = My younger brother has even more money than I do. = Nihongo yori chuugokugo no hou ga, hatsuon ga muzukashii. = Chinese pronunciation is more difficult than Japanese. = Denshibukku yori kami no hon no hou ga yomimasui. = Paper books are easier to read than ebook. = Michiga konde iru kara aruite iku hou ga hayain janai? = There is a traffic so, it will be faster if you walk. Don’t you think? = Kocchi no hou ga ii ne. = This one is better. = Ashita no hou ga tsugou ga ii desu. = Ima no kamigata no hou ga iine. = I like your present hairstyle better. ~ より( = yori) : When you describe something comparing with certain thing / time period / person. = Kyonen yori nihongo ga jouzu ni narimashitane. = Compared to last year your Japanese has been improving more. = Your Japanese has improved since last year. = Kanojo wa, watashi yori mo ashi ga nagai. = She has longer legs than I. = Kono omocha wa gosai yori shita no kodomo muke desu. = This toy is for children under the age of five. = Mae yori hiroku natta ne. = It is (looks) more spacious than before. = Musuko san, izen yori akaruku narimashita ne. = Your son is getting more cheerful than before, isn’t he? = Omotta yori taihen datta. = It was harder than I thought. = Kare wa souzou shiteita yori motto ikemen datta. = He was even cuter than I imagined. = Yononaka wa yori benri ni narimashita. = The world has become even more convenient. = Yori hayaku jouhou wo te ni iretai. = I would like to obtain the information even faster. = Yori ookina ie ni sumu tameni wa motto chokin wo shinakute wa ikenai. = I have to save more money In order to live in a bigger house. = Saikin, yori hinpan ni kare kara denwa ga kakatte kuru. = I’ve been getting a call from him much more frequently than usual now. = Yori kirei ni toreru kamera ga hoshii. = I would love to have a camera which I can take even more beautiful pictures. = Nihongo ga yori jouzu ni hanaseruyou ni naru niwa doushitara ii desuka? = What should I do in order to be able to speak Japanese even better? Note: In conversation, we use もっと ( = motto) more. You may see this type of lines in advertisement. = Yori hayaku, yori anzen ni. = Yori karuku, yori tsukaiyasuku. = Lighter and easier to use. = Dare yori mo anata no koto wo aishite imasu. = I love you more than anybody. = Anata no koto wo dare yori mo aishite imasu. = Kanojo no nihongo wa dare yori mo umai. = Her Japanese is better than anybody’s. = Nani yori mo taisetsuna mono wa kokoro no naka ni arimasu. = The most important thing is in your heart. = Uchi no chiimu wa doko yori mo tsuyoi. = Our team is stronger than any other team. = Kodomo yori taisetsu na mono wa naiyo. = Nothing is more precious than my child, you know. = Kimi yori sukina hito wa inai. = Tada yori takai mono wa nai. =Nothing is as costly as a free gift. = Arigatou, Chuzzle Sensei, Frisky Sensei! = Thank you, Chuzzle Sensei and Frisky Sensei. = Futari tomo kawaii to omou yo. = I think you are both cute. 東京駅　より　徒歩１０分　By walk 10 minutes from Tokyo Railway station . Is it correct sensei ? Sensei, Can you please explain why? In this case what is より compare to? This より is a literal way to say から (= “from” ) and not comparing anything. Why is it that they are in は form and not in が? You use が to emphasize what comes before. dare yori mo maggie sensei ga ichiban joujuu da to omoimasu. Can you just tell me what you meant by “joujuu” ? jouzu??? ７月２日より = 7月２日から = From July 2nd. 持ち寄る= to bring each other. Hi, Maggie-sensei! Sorry to bother you! I have a line that I’m trying to make sense of with ‘yori’, but it’s difficult for me because I think it may be in slang. Actually, there are a number of things I don’t understand about this! First of all, my understanding is something like “Even though I used to be cute, there was a time I was not.” Although I think I might be completely wrong. I don’t think I’ve seen the construction of ‘maekara’ before. Does this mean ‘before what you see in front of you’? And why do they put the ‘yori’ comparative before the negative form of ‘was not cute’ without a subject and action? This sentence is confusing me a lot. I would appreciate any help you can give. Thank you very much, Maggie-sensei! より+adjective = even more + adjective. I don’t know the context but the speaker is talking about herself? If so, someone told me that I was cute before but I got even cuter. よりかわいくなった= to become even cuter. That’s right. The speaker is a very egotistical person who is talking about herself. Thank you for showing me this new form of ‘yori’. I will definitely remember it. I appreciate your time to answer all these questions! Thank you for helping me understand the beautiful language of Japanese better. 1. Can you explain the change of verbtenses in your sentence: “Shinkansen de iku yori hikouki de itta hou ga hayaku tsuku.” Why is it “itta”? I am very fortunate to have zoheb and you to find the typos. = Shinkansen de iku yori hikouki itta hou ga hayai. = Shinkansen de iku yori hikouki iku hou ga hayai. = Jibun de yaru hou ga ii. = It will be better to do all by myself. A yori B no hou ga mashi. in the examples: Dochira mo suki desu / Dochira mo suki dewa arimasen..
can I say demo instead of mo..like : Dochira demo suki desu/ dochira demo suki dewa arimasen? Lately I studied this sentence ,and made me confused .. I always use demo in positive situation like >> dochi demo ii yo.. Your question seemed very easy to answer at first but it is actually very deep. どちらも好きです。= Dochira mo suki desu. どちらも好きではありません。 = Dochira mo suki dewa arimasen. どちらもいいです。= Dochira mo ii desu. = Both of them are good. どちらでもいいです。= Dochira demo ii desu. = Either one is fine. OK, I will add it to the request lesson list. but I still can say: dochira demo ii desu if I want to emphasize on one of them, righ??? dochira demo suki dewa arimasen = means I don’t like any of them..
→”Dochira demo ii” means “which ever” (It doesn’t matter) and so you are not emphasizing neither one. “Dochira mo ii” means you like both of them. You have to say ”Dochira mo suki dewa arimasen.”　= I don’t like any of them. Hello! Where can I ask questions or request help with translations? Do you have an e-mail for that purpose? Or is it okay to ask questions that are not relevant to the lesson topic here in the comment section? You can leave a question in Maggie’s Room. But I don’t help translation. Niku yori sakana no hou ga suki desu. = Satou-san wa [tanaka] Yamada-san yori mo kechi da. = Kyone [kyonen]yori nihongo ga jouzu ni narimashitane. = Anoko wa, watashi yori mo ashi ga nagai. = [why not “that kid”]!koujichuu! ﻿﻿ [She] has longer legs than I.
I fixed all the typos. あの子 is not necessary “that child/kid”. You can refer to a young girl (or sometimes a boy). But I changed あの子 to 彼女 to avoid the confusion. = Kyoto is closer to Osaka from Nagoya. Am I missing something? hahaha. Thanks again for the great lesson.